The New York Yankees came into the weekend series with archrival on Yawnkee Way, the Boston Red Sox coming fresh off of taking two of the three from both the New York Mets and the Tampa Bay Rays. As baseball’s hottest team, the Bombers left Boston following Sunday’s win with three more victories than they had coming into Friday, as they completed the Boston Massacre sweeping the Sox. Game 1 turned into a pitcher’s duel that many did not see coming with struggling starters CC Sabathia and Justin Masterson on the hill. An RBI double from Carlos Beltran put the Yankees ahead in the first inning and the Yankees would then scratch another run via base hit by Brian McCann. It was the 8th inning that was one to remember. Facing Junichi Tazawa of the Red Sox, Yankees manager Joe Girardi elected to pinch hit Alex Rodriguez for a struggling Garrett Jones (thus, ignoring the lefty/righty matchup). Oh what a genius move that was by Girardi. Sitting on 659 career home runs on a 3-0 count in a tie game, Rodriguez launched an absolute shot over the Green Monster to put the Yankees in front 3-2. The jubilance that followed was unlike most Yankee moments as the Yankees took game one behind good pitching and a huge hit from A-Rod. Game 2 was another pitcher’s duel from start to finish. Flame throwing right-hander Nathan Eovaldi took the bump for the Yankees and he was effective across 6.2 innings allowing 7 hits, 2 earned runs, 1 walk and 2 strikeouts. It wasn’t his best outing, but he certainly kept the team in the game and ended up getting the win. Brett Gardner was the star of the day going 2-4 with driving in 3 of the team’s 4 runs on the day. Chris Young then came up in the 9th and went yard once again giving the Yankees a big insurance run that turned out being useful, but unnecessary as Dellin Betances dominated the 9th inning. In his first save opportunity of the season, Betances went 1.1 innings striking out all 4 batters he faced. Chris Martin and Justin Wilson combined to pitch 1 inning allowing 1 hit, 1 walk and 1 strikeout between the two of them. Every Yankee hitter collected a hit other than Brian McCann and Mark Teixeira as this was a great team win. The Yankees then looked to wrap up the sweep on primetime, Sunday Night Baseball. Game 3 featured Adam Warren vs. Joe Kelly in what turned into a blowout early. In the first inning, Jacoby Ellsbury hit a leadoff single, only to be thrown out a second on a fielder’s choice off the bat of Brett Gardner. With two outs, Mark Teixiera hit an “oppo-taco” over the MONSTAH for his 9th Tex-Message of the season. The Yankees bats came back as the leadoff man Ellsbury picked up his 2nd hit of the night followed by a single from A-Rod and a 2-RBI double from Brian McCann. Carlos Beltran then picked up an RBI double for himself. The right-hander Warren was nearly unblemished up until his 6th inning of work and left the game with a line of 5.2 IP, 4 H, 4 R, 2 BB and 2 SO. 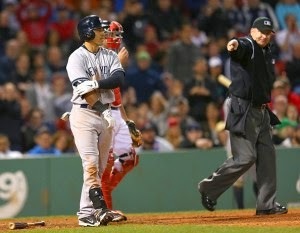 Jacoby Ellsbury had a perfect day at the plate going 4-4 with a walk and HBP (more on this in a moment). Brett Gardner also stayed hot going 2-6 with a 3-run homer. Things got a bit dicey in the 6th inning when Warren (completely unintentional, in my opinion) hit Red Sox outfielder Hanley Ramirez with a 2-0 fastball. Ramirez was incredibly unhappy and classless in his reaction as he stared down Warren and shouted at him the whole way to first. Brian McCann, quite obviously, was not too pleased with this stunt by Ramirez and the two of them shared a few words. Following that, Jacoby Ellsbury was thrown at (pretty blatantly) 3 times in the 8th inning. Red Sox reliever Edward Mujica threw one up and in on the first pitch, missed outside on the second, came inside on the third, then throw one straight into Ellsbury’s rear-end on the 3-0 count. Both benches were immediately warned and CC Sabathia stepped out over the railing in the dugout ready to back up his teammates had things snow balled from there. The Yankees got into a bit of trouble in the late innings as Andrew Miller came in only to walk two batters and have Chase Headley commit a 2-out error in the bottom of the 9th. The showdown between David Ortiz and Miller in a 3-run ballgame with 2 outs where a grand slam would’ve won it for the Sox was tense, but Miller prevailed as the Yankees completed the sweep of the Red Sox. Alex Rodriguez’s pinch hit, game-winning home run in the top of the 8th off of Junichi Tazawa was one of the cooler things I’ve seen from a Yankee player. On a 3-0 count, Rodriguez unloaded on a fastball and that ball went over the monster in about 3 seconds. What was even cooler was Alex Rodriguez’s post-game interviews with both Meredith Marakovits and Suzyn Waldman. A-Rod showed an emotional side that we aren’t used to seeing as Yankee fans as he was reminiscent of his family and became emotional in his statement: “I was thinking about my daughters and my mom…it was emotional. I was thinking about all the folks that stuck with me in all my tough moments.” He was unable to answer to answer further questions just nodding his head to the statement from Waldman that Willie Mays was Rodriguez’s father’s idol. He certainly does have the right to be emotional, and his remorse was seen as he desperately wants to put his past behind him. The home run in itself, and the humbling interviews he gave after have to be at the top of my favorite thing’s from the team this season. Dellin Betances has been absolutely dominant, especially of late. He appeared in games one and two with a total stat line of 2.1 IP, 1 H, 0 R, 1 BB, 6 K’s in those two games included the save he earned in game 2. He struck out each of the 4 batters he faced in his first save opportunity of the season and was simply unhittable. Andrew Miller, Betances’ wingman, has looked just as sharp throughout the season and continued to mow down hitters in this series collecting 2 saves. Miller collected his 9th save of the season in game one pitching a perfect ninth inning collecting one strikeout. He then struggled a bit in his getting his 10th save of the season, but ended up closing the door in game 3. Miller and Betances have yet to allow an earned run all season, and that type of dominance in the 8th and 9th innings is going to make this Yankee team hard to beat. Starting pitching was a key for the Yankees in this series. Again, CC Sabathia pitched a great game and got nothing to show for it getting a no-decision. Sabathia went 6 innings allowing 7 hits, 2 runs, 2 walks and 3 strikeouts as he put the team in a position to win. Nathan Eovaldi put together a very similar line in game 2 going 6.2 innings allowing 7 hits 2 runs, 1 walk and 2 strikeouts. Chris Young once again exemplified his need to be in the starting lineup more often. Young started game 2 of the series going 2-4 with a double and a big home run giving the Yankees an insurance run in the top of the 9th. He raised his batting average to .317 and stroked his 6th homer of the season, while Carlos Beltran still hits to a clip below .200, still without a home run. The top of the order hitters Jacoby Ellsbury and Brett Gardner continue to get it done. The duo had a very successful series setting the table at the top of the order and sport batting averages well over .300 to this point in the season (.351 and .320, respectively). Additionally, they have each ran the bases incredible effectively, (9 and 8, respectively). The team has been nearly unbeatable during their hot stretch as they currently sit atop the standings in the AL East. As the hitting has come around, so has the defense. Interestingly, this is the first sweep of 3 games or more between the two teams since 2006 which shows the good ball the Bombers are playing. The team is playing well rounded ball and their pitching and bullpen have imposed their will on opposing hitters. If this team continues playing similar ball that they have over the past two and a half weeks (13-3 over that span), they could make this a successful season. The Yankees will now continue their road trip north of the border as they begin a 3 game set with another division rival, the Toronto Blue Jays. The series will be Monday, May 4 through Wednesday, May 6 with all three games beginning at 7:07 PM ET. The starting pitchers in those three games are undetermined as of now but look for Chase Whitley to get a start in Masahiro Tanaka’s absence, along with Michael Pineda and CC Sabathia. The team is playing some fantastic baseball as I referenced earlier that they are 13-3 in their last 16 games, so let’s hope the Yankees extend their lead they have in the AL East! Additionally, we will get back on posting articles on a more regular basis. I had actually typed up the series recap for the series against the Rays but time got away from me and I wasn’t able to get it posted in a timely manner. However, consistency will come, and if you’re an active reader and interested in writing for us, send us a DM on our twitter account for details! Follow @BronxBomberBlog on twitter for more Yankees news, analysis, live tweets, satire and all things Yankees!